Meteor-3M is a satellite manufactured by Joint Stock Company "Research and Production Corporation Space Monitoring Systems, Information and Control and Electromechanical Complexes" named after A.G. Iosifian" ("VNIIEM Corporation" JSC) Moscow, Russia. Meteor-3M NSSDC / COSPAR ID: 2001-056A NORAD ID: 27001. Type: Weather. Meteor-3M is a joint Russian-US environment/atmosphere monitoring meteorological satellite. Destination: Medium Earth Orbit. The Meteor-3M was to be followed in 1996 by the first of the Meteor-3 class, which was finally put into orbit in 2001. In addition, the average daily power available nearly doubled to 1 kW, and the spacecraft stabilisation accuracy was improved by an order of magnitude. Pointing accuracy was improved. The store and forward transmission mode was converted from the earlier 466.5 MHz analogue to 1.69-1.71 GHz digital. The 1.4 m (4.50 ft) diameter, 2.2 m (7.20 ft) long spacecraft bus carried a payload truss (as on Meteor 3) with dimensions 1.800 mm by 1.600 mm by 270 mm. 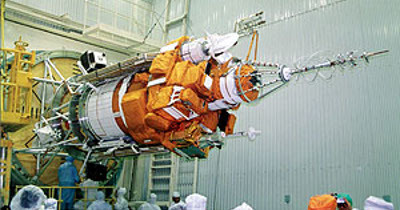 High-temperature ammonia thrusters (0.147 N) were used for orbital adjustment. Originally slated for a 900 km x 950 km orbit with an inclination of 82.5°, Meteor 3M was instead inserted into a 1000 km altitude circular sun-synchronous orbit with an inclination of 99.6°. In 1994 NASA was negotiating with the Russian Space Agency to carry the SAGE III (Stratospheric and Aerosols and Gas Experiment) instrument on a 1998 Meteor. This did not fly until the first Meteor-3M flight in 2001.